Pop everything into a food processor and process until the mixture starts holding together as a mass. If it doesn’t do so after a minute or two of processing (for this depends on how moist the dates are and the density of the nut butter), add just a little water – a tablespoon is generally enough. Put all your coatings into separate bowls so they’re handy – as mentioned above, i’ve used variously dessicated coconut, crushed cacao nibs and green tea powder, as well as crushed toasted nuts, cacao powder, toasted sesame seeds…basically anything you like! Roll into 1-inch balls. Put a small amount of extra coconut on a small plate. Roll the balls in the coatings as you go. Arrange on another small plate and refrigerate for about an hour, then enjoy! 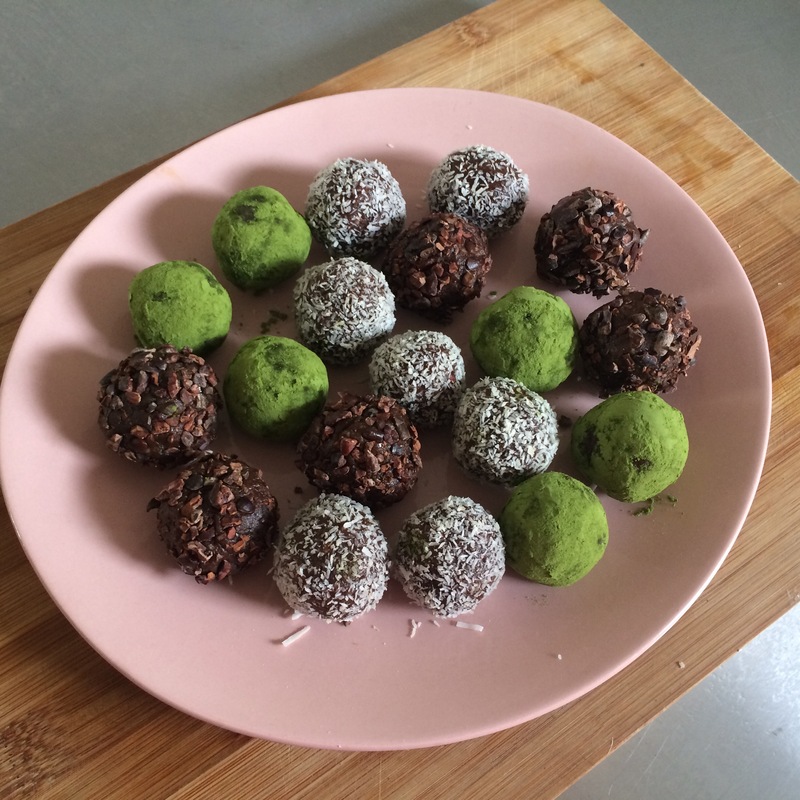 Posted on November 1, 2015 January 14, 2016 by Anne BPosted in UncategorizedTagged bliss balls, no bake, sweet treats, vegan. Previous Previous post: Bountiful beetroot. Next Next post: Body image, The Rock, and me.